SPY (or S.P.Y.) 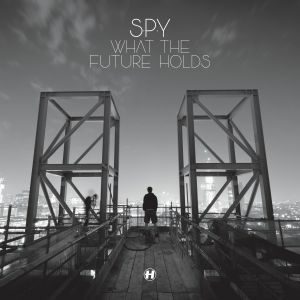 is the alias of Carlos Lima, a Brazilian born, London based musician who released his first full length album, What the Future Holds, in 2012 through Hospital Records after issuing a number of EPs dating back to 2006. He focuses largely on the liquid funk branch of drum and bass and combines a heavy dose of ambiance mixed with loud, repetitive percussion to keep the songs moving forward. He expands on his sound to create the standout crossover song Love Hurts, which has slow jazz piano chords playing with a subtle double bass and jazz drumming that is at times washed out by the overlain drum and bass percussion. While the jazz portion of the song is a slightly sped up sample of My Precious Thing by Llorca, the only other obvious samples that exist on the album are the distorted spoken word dialogue on Surge that has been lifted from the Remedy Entertainment video game Max Payne and a telephone being dialled and ringing on Kiss the Sky. More notably, the title track has a live performance of an oboe, bassoon and flute performed by Emily Johnston, Harry Ventham and Gemma Hawkins respectively, which are used to create a cinematic quality within the song and departs entirely from the drum and bass sound for roughly half of its length. Diane Charlemagne creates some memorable vocal performances on Analogue Dreams, See the Light and Hammer in My Heart, helping to distinguish the songs on the instrumentally lead album. Vocalist Ian Shaw features on the title track but unfortunately, like the jazz drumming on Love Hurts, he has to compete with the percussion to be heard clearly during his performance. Minor edited background vocals are also present on Bass Terror and Adrift but don’t have the same presence as the other performances. Unfortunately, What the Future Holds loses steam about 3/4 of the way into the album. This is partially due to most of the songs keeping a similar pace throughout, but mainly because SPY fails to justify the excessive length of the album, as there isn’t always enough material to flesh the songs out for as long as they are while keeping the listener engaged. If the CD edition was cut back to the length on the vinyl release (songs 1 to 8, making it 46 minutes long) then the condensed time would have greatly improve the listening experience.